Is there a way to position an item that is opened from a carousel. Say for example that there is a carousel with movies to the left on the scene and when any one of them is opened they should be positioned to the right. 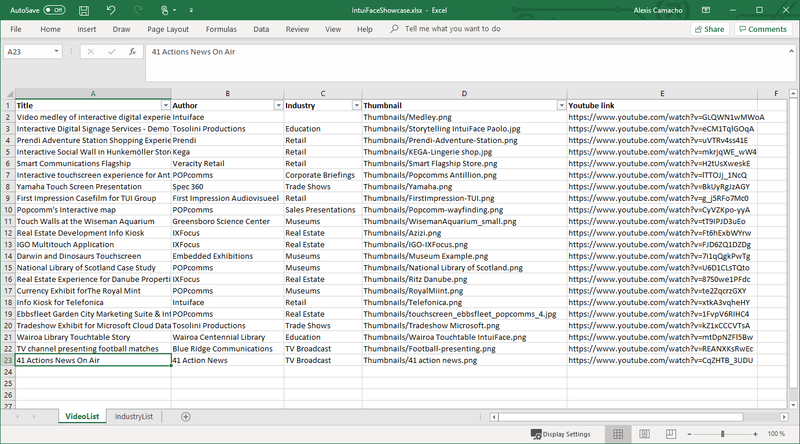 The fastest and simplest way to do that is to put your images in an Excel file, use it as a data feed for your Carousel, and set up a single trigger/action that will open the image on the side on tap. In the action, is there a way to reference a column as the new source for the opened image? For instance if the carousel contains thumbnails but when tapped one wants to show a larger image. …my appologies if this is already explained in the manual somewhere. I will search. You just have to change the binding and link the “big” picture to the Image Asset. This type of behavior is used in our Intuiface Presentation in the Marketplace on the Video Showcase part. As you can see, we have a column for thumbnails, and another to display a Youtube video. I also recommend you to do our Self-Guided Training with Step-by-Step Tutorial in order to learn the basics. We also have this Introduction Webinar that may interest you. I have successfully tested two columns. Does the image from the second column need to exist on stage - for instance in the carousel - to be usable in the “big” image? Also - get value from index in carousel does not seem to work. I would like the big picture to show the index image from the carousel as default image. No default image results in that placeholder image “MY IMAGE” which is not so nice.